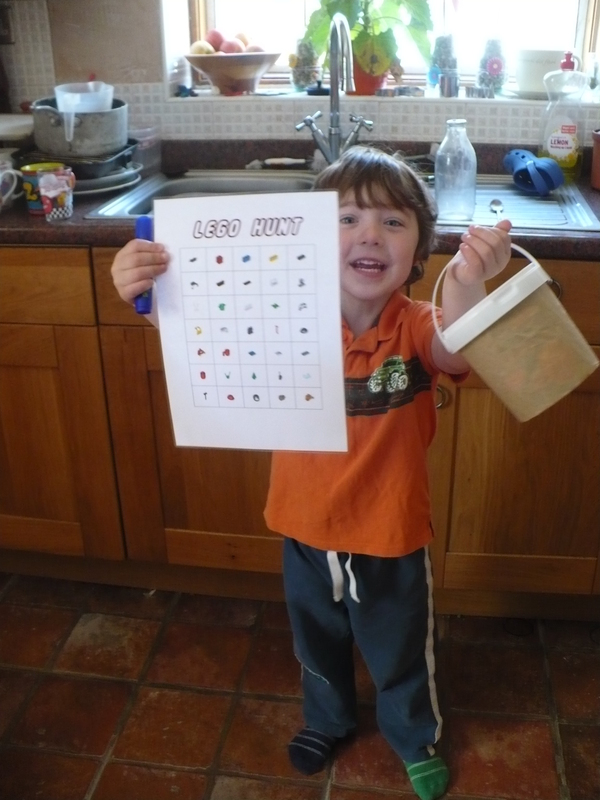 Anyhoo, I first saw the lego hunt idea at Best birthday ideas. Hmmmm, which doesn’t seem to be there anymore. My pin for it is here. The one featured was some sort of bingo party game. I made our hunt sheet by copying the images from the pick a brick section on the lego website. Aside from copyright, you’d have to make your own as it would have to be what’s in your child’s collection. 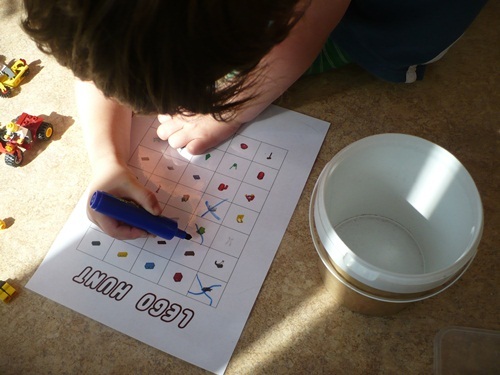 I presented it to Oscar (having laminated it) with a wipe clean pen and a bucket for collecting items in. There is now carnage in lego city as he took stuff apart to find the bits instead of checking the brick boxes… doh! Much fun was had by all. In fact he played with it most of the day as he then hid the bricks Easter egg hunt style for me to find and then took a turn finding after I hid them etc etc. In fact there were so many etc’s that I might be hiding the list and bucket for a few days! By the way the font is a download, I forget where from, called Legothick. If you’re of that kind of mind, also check out lego blocks and the oh so cool, lego system, which is a wingding font featuring lego minifigures!! !